Not many know about Leeuwarden, the capital of Friesland. Those who do are either born here, come from the surrounding provinces or are German students. Ut het nooit wat weest, en ut sil nooit wat wurde. Leeuwarden has never been anything, it is nothing and it will never ever be anything. This is some kind of humorous verdict if you ask a Leeuwarder with less hope how he would describe his city. Those who are more patriotic would say in their defense that Leeuwarden is the heart of Friesland and come up with their awesome cows and not to forget the famous leaning tower. This new event is spread throughout the Netherlands and even reached sleepy Leeuwarden. This is a giant question and to answer it takes time, mindful experiences, magic moments and tons of love. Happiness is an inner awareness of being alive right now in this moment, no matter how good or bad it might be. Life is a book with many chapters. Some pages are dark when life is hitting us hard. Others are light when life is full of brightness. To write a book is not always easy. Sometimes we don’t know what to write about because we don’t know who we really are anymore. We forgot ourselves in the confusion of a world that has become more connected and regardless still remains so distant. What we have to know is that it’s us ourselves who are in charge of our own happiness. We’re the guardians of our happiness. We decide to be happy. Every day. Every hour. Every tiny so fraction of time. Another important fact about happiness is once you are in possession of it, to share is the common rule. Only shared happiness can be true happiness. To make other people happy by sharing your happiness will multiply your happiness, that’s for sure. What makes you happy and do you want to share it? This is all what the Geluksroute is about. Giving ideas of what happiness can be, where and how it can be found and most important, help others to be happy too. 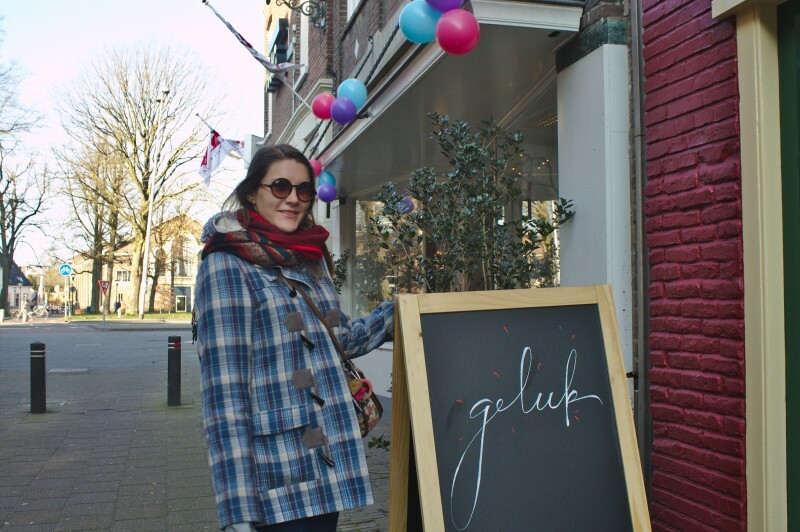 A walk through Leeuwarden makes happy, passing several shops, galleries, handicraft stores, stalls and creative hubs. All those places have in common that they create something that make people happy. By trading their goods of happiness, informing about their work and teaching us something new they’re sharing their idea of happiness. We learned how to make little gift boxes and lost ourselves while coloring mandalas. We filled our stomachs with self-made pumpkin soup and tried healthy fruit smoothies. We told strange people our travel stories and got to know more about them in return. They’re no longer strangers. We listened to the gentle vibes of a young artist. We walked by the canals, the sun straight above our heads. Even a former prison turned out to be a creative co-working space, producing and sharing happiness. This weekend, in the unknown town Leeuwarden, we were indeed happy. Happiness comes in waves. It comes rough and wild, fully refreshing and strengthening. We’re surfers, taking wave after wave wishing for the absolute thrill, endless satisfaction. To wait for a wave can be boring. It requires patience, vitality and the strong desire to wish for the next wave to be as mindblowing as the last one. Surfers long for the perfect wave, giving them back all those things that they endowed to the ocean, hoping for a giant return. Surfers are children of the ocean. Life is like an ocean. Sometimes dangerous, unbeatable. At other times smooth, sensitive. Leeuwarden revived at this weekend, bringing people together in the name of shared happiness. In the evening we joined the Nightwalk, an organized walk through Leeuwarden at night. Colorful illuminated canals, fresh breeze from the fields, while leaving the town, reaching into the countryside. It was a clear star-lit sky, not completely dark. Some constellations could be vaguely discerned. The silhouettes of 12 people were following the trail of happiness. Walking makes happy, especially walking at night when everything is quiet and peaceful and you can let your thoughts wander. thanks Agness! Happiness means to love and to be loved 🙂 simple definition but true.